Eucalyptus essential oil is distilled from the fresh leaves of the eucalyptus tree of Australia and has been used in Aboriginal medicine for thousands of years. It’s even used in over-the-counter medicine today in vapor rubs, inhalers, rash creams and mouthwashes. 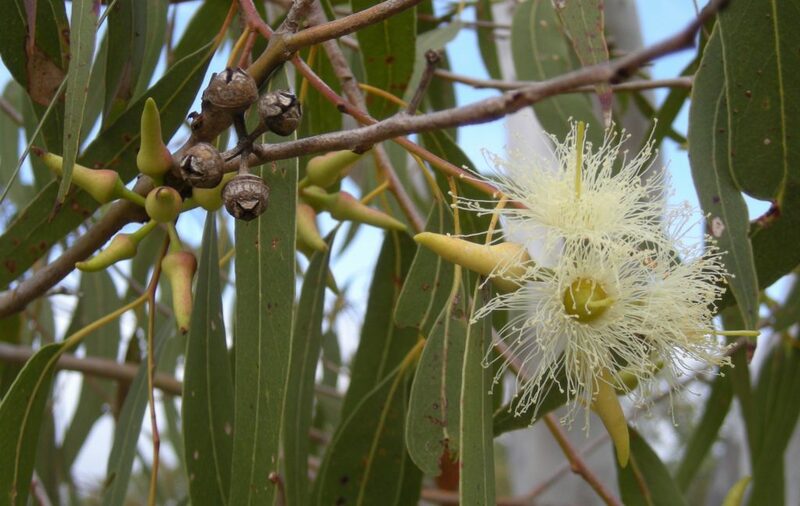 Its active medicinal component known as eucalyptol has been shown in medical studies to reduce symptoms of infections. However, it also helps kill off the underlying infection so you can recover from colds and flus quicker. You’ll definitely want this oil in your natural medicine cabinet during flu season. Eucalyptus essential oil can help clear up an unproductive wet or dry cough through its expectorant properties that act much like a vapor rub. In fact, many over-the-counter vapor rubs contain eucalyptus oil or eucalyptol. You can create your own homemade vapor rub by diluting eucalyptus oil in a carrier oil at a 5 to 15 percent ratio. Inhaling eucalyptus oil thins, loosens and breaks down mucus in the lungs so you can expel it more easily. Eucalyptus oil helps you fight off respiratory infections in other ways as well. By improving respiratory circulation, stimulating your immune system and providing an antiviral action against infections, it can help you recover quicker [1, 2]. Eucalyptus oil may be the most powerful essential oil to combat respiratory infections, including asthma, bronchitis, chronic obstructive pulmonary disease and common viruses like colds and flus . One study showed that within 20 minutes of inhaling eucalyptus oil, people with upper respiratory tract infections had less severe symptoms of throat pain, cough and hoarseness . The cooling, revitalizing scent of eucalyptus makes it ideal for boosting mental energy. By clearing your airways, it improves oxygenation and reduces “brain fog.” One study showed that applying eucalyptus oil to the forehead and temples improved cognitive performance in 32 participants. You can use eucalyptus oil as your go-to aromatherapy oil to relieve mental fatigue by diffusing it, inhaling it from the bottle or putting some on your temples or neck to take in the aroma. Eucalyptus essential oil can do wonders for your hair. Healthy hair growth begins at the scalp, where eucalyptus oil can stimulate hair follicles by increasing microcirculation. When there’s more blood flow in the scalp, hair follicles get more nutrients and energy to grow healthy hair strands. Eucalyptus oil also moisturizes a dry, itchy scalp and even treats head lice naturally. Add 2 or 3 drops of eucalyptus oil into a dollop of shampoo to get these benefits. You can also use eucalyptus oil as a conditioner to enhance the shine, thickness and strength of your hair. Dilute it in a carrier oil like coconut or avocado oil at a 5 to 10 percent concentration and massage it into your hair an hour or so before you wash your hair. Eucalyptus has insecticidal properties that work not just on head lice, but also on other insects, making it useful as a natural bug repellent. Diffuse it in your home to repel flies, mosquitoes and other bugs in your home, and use it to make a homemade bug spray for going out. You can also apply a drop to the site of an insect bite as an antiseptic that reduces irritation and promotes healing. Applying eucalyptus essential oil to the site of a cold sore reduces inflammation and irritation, which can reduce its appearance. Cold sores are caused by a virus called herpes simplex. Test tube studies have shown that eucalyptus oil can kill this virus, suggesting it could be a natural medicine for treating cold sores. If you have asthma or seasonal allergies, eucalyptus oil can help you relieve symptoms and even act as a natural antihistamine. By opening up your airways and reducing inflammation, it helps reduce the severity of asthma attacks and promotes easier breathing . As an antispasmodic, it also relaxes the bronchial tract. If you have sinus congestion, inhaling eucalyptus oil can help break up, thin out and dislodge mucus. To relieve sinus pressure and congestion, you can inhale it using a diffuser, or you can add a few drops of eucalyptus oil to a bowl of steaming hot water. In addition to helping you deal with the symptoms of allergies, eucalyptus oil down-regulates the immune system’s response when you come in contact with an allergen. Allergy symptoms come from your immune system’s reaction to a perceived threat, so by reducing this reaction, eucalyptus oil prevents symptoms. Eucalyptus oil is a natural analgesic, which means it relieves pain. Combined with its anti-inflammatory properties, it can help resolve muscle pain, stiffness, soreness, joint pain, aches, fibrosis, sprains and nerve pain. In an experiment with arthritis patients, those who inhaled eucalyptus oil for 30 minutes a day had reduced pain compared to those who inhaled a placebo oil . Likewise, a study on people with chronic headaches showed that eucalyptus oil treated headache pain . Besides inhaling it, you can also apply eucalyptus oil topically on the site of aches and pains. This allows you to inhale the aroma while the healing compounds absorb through your skin. Eucalyptus essential oil is so powerful that even inhaling too much can cause side effects. Avoid taking it orally or applying it directly to the skin without a carrier oil. If you’re inhaling eucalyptus oil with the help of a diffuser or steam, do so for no longer than 30 minutes at a time. Its powerful expectorant properties can cause excessive coughing. For this reason, it should be used in small concentrations if you apply it to your skin as a vapor rub.